As we approach Mull on the ferry from Oban, we spot Black Guillemots, a Great Northern Diver in full breeding plumage, followed by two Red-throats, and then an Otter, steaming in the opposite direction to the ferry, and we haven’t even landed yet! Next morning the sky is blue and we enjoy a glorious sunny day, while it is pouring down at home. On the fabulously scenic drive west through Glen More and along the Ross of Mull, several Whinchats are early sightings and then a brief stop at the Pennyghael Hotel produces smart male Siskins on the feeders and another Great Northern Diver just offshore. From Fionnphort we hop on the ferry for the short crossing across the sound to Iona hoping for Corncrake, and before very long we can hear several rasping calls amongst a Buttercup-filled meadow. As we scan the field, a Herring Gull swoops and flushes a Corncrake towards us. Unperturbed, the crake calls again and it soon sounds so close one can almost feel the vibrations from the birds throat, barely ten yards away but deep in the grass. Suddenly it sticks it neck out and throws back its head shouting “crex crex” and so we ‘have it in the bag’! Pleased with the view we enjoy a picnic lunch by the beach with a Ringed Plover and several singing Rock Pipits. Soon after lunch we home in on another Corncrake calling from a different flowery meadow, again just yards away and this time in a clump of Yellow flags. Our patience is rewarded as a Corncrake breaks cover from the Irises, followed by a second bird in hot pursuit! As one flies off, we get a gobsmacking view of the victor out in the open, showing the grey neck and richly rufous wing patches before it takes cover again. What an amazing view given how skulking these birds usually are. We soon realize why they are so furtive, as a Herring Gull which had been patrolling up and down the meadow, swoops down flushing two birds and grabbing one! We watch in horror as the gull swiftly kills the hapless Corncrake and repeatedly tries to wolf down the whole body, head first. Even though we didn’t see the gull successfully swallow the Corncrake, it had the demeanor of a specialist Corncrake catcher, and we move on cursing the blasted Herring Gull. After the success of ‘Operation Corncrake’, Golden Eagle is our next target and at the last stop in Glen More en route back to the hotel, we spot not one but two of these huge and majestic birds gliding together above a ridge; a brilliant end to a memorable day. In view of this morning’s wet weather, today will be Saturday, tomorrow will be Thursday, and Saturday will be Friday, while yesterday was Wednesday as planned. (Hope that’s clarified the situation!) There are two Red-throated Divers just off the beach during breakfast and then we head north for Tobermory, while it is too wet for Otters! After tea and cakes, next stop is beautiful Calgary Bay, with Great Northern and Black-throated Divers showing really well just offshore in the same scope view! We couldn’t wish for better views, especially side by side, just like a plate from a fieldguide. Meanwhile our search for an Otter produces a dark brown Mink at close range, repeatedly dragging small fish out of the sea for its kits, hidden amongst the rocks. Further south on the B8073, we find a family of four head bobbing fledgling Wheatears with three Ravens overhead and a Golden Eagle soaring just below the cloud base one and a half to two miles away. The picturesque Eas Fors waterfall produces a juvenile Dipper and at last we find an Otter in Loch na Keal, munching a fish just beyond the rocks. As we watch the Otter, there are two adult White-tailed Eagles watching from the tops of nearby conifers which quickly assume the lead role in this wildlife spectacle, looking magnificent in the scope with their blonde heads and awesome yellow bills. What a grand finale to another productive day. Even before leaving the hotel this morning we add two new birds to the list; Common Tern, and Goldcrest, with a pair showing really well on the car park. 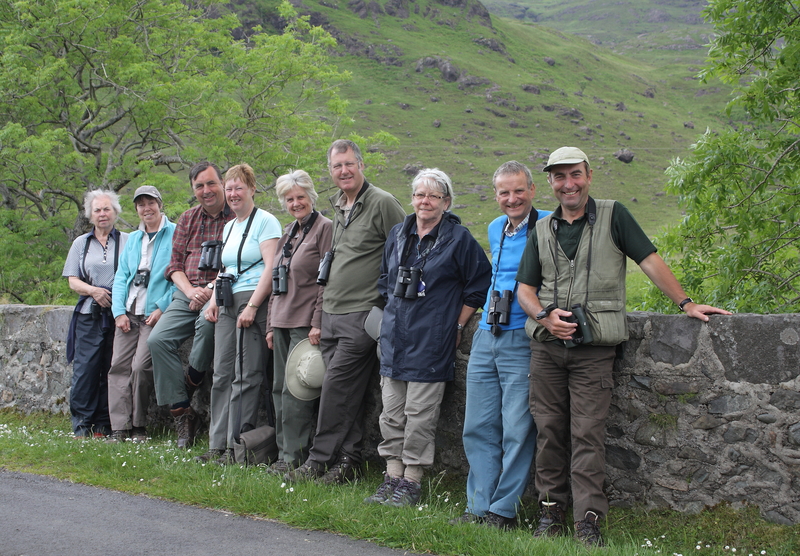 Out on Craignure Bay, at the bottom of the hotel garden, we also enjoy lovely views of a pair of Red-throated Divers. A stroll to the Macquarie Mausoleum through delightful parkland produces Rock Dove, Spotted Flycatcher, Whitethroat and Garden Warbler, and on the way to Ulva Ferry, we say hello again to ‘Eddie the Eagle’, still sitting in his treetop and ducking a persistent dive-bombing Hooded Crow. By now the sky is blue, the sun is warm and the sea incredibly calm for our cruise to the Treshnish Isles. Not far from the jetty, another White-tailed Eagle is sitting in a dead tree on Ulva, and further on we meet five Whooper Swans on their way north to Iceland! As we approach the isles, the sea is peppered with auks, a couple of Great Skuas cross our bow, and sailing past one of the smaller islets surrounded by miles of sea, a Corncrake is calling! It is amazing how far these birds can fly despite their design. The views from Lunga are stunning with dozens of islands in every direction, from Jura to the south, to Skye to the north, and all bathed in glorious sunshine. What a fabulous place for a picnic with such panoramic views and hundreds of noisy seabirds including Guillemots, Razorbills, Kittiwakes, Fulmars, Shags and inquisitive Puffins just a few feet away. It doesn’t get any better than this. Two hours pass in no time at all and so we must get back on board for the onward journey to Staffa, where we land in search of Twite. 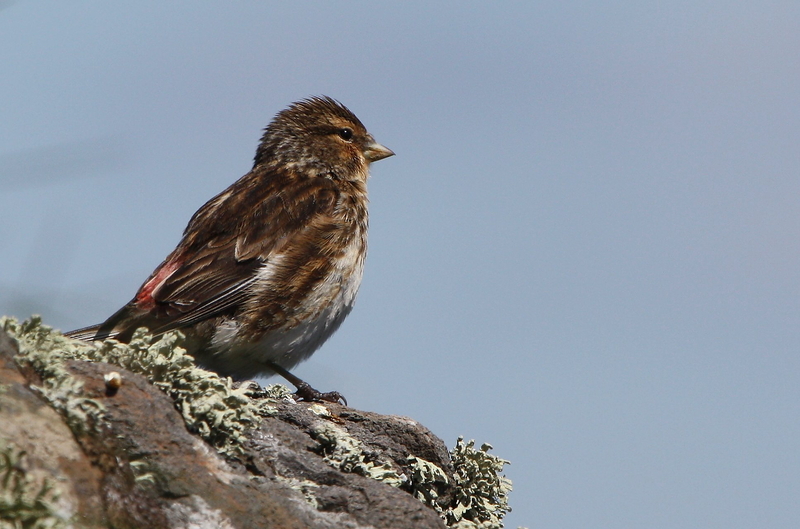 We have one hour to find them, and after a drumming Snipe, we soon enjoy really good close views of these ‘upland Linnets’ with time to spare for simply soaking up the tranquil atmosphere of this island paradise. It’s our last day on Mull and the main aim is to explore the southeast corner of this fantastic island and hopefully get better sightings of Otter and Golden Eagle. We begin at Grass Point, with fabulous panoramic views, a chorus of Willow Warblers and a male Great Spotted Woodpecker nicely framed by its nest hole. By now, Eider, Red-breasted Merganser and Common Sandpiper have become ‘everyday birds’ along with Golden Eagle when we spot one from the north shore of Loch Spelve, soaring along the ridge while being mobbed by a couple of ‘little’ Ravens. Meanwhile Loch Buie produces diving Gannets and plum views of a Cuckoo using a wire to drop down on hairy caterpillars. Returning to Loch Spelve, we scour the south shore for an Otter and not far along we’ve got one! Crikey, it’s huge but sleek, and we follow alongside in the vehicle watching the stream of bubbles as it slowly hunts along the shore by sliding through the mats of seaweed, regularly popping its head up for air. After several minutes of trailing this iconic creature, it emerges clean out of the water with an Eel in its jaws and we watch spellbound as it munches through the Eel in full view at close range! After another successful fishing expedition, it scampers up the beach and pops out on the opposite side of the road right ahead of us, by following a stream below the road, to disappear into the woods. Wow, what an epic spectacle. That was the Otter sighting to beat all others and a stunning climax to four hugely productive days on ‘Marvellous Mull’.